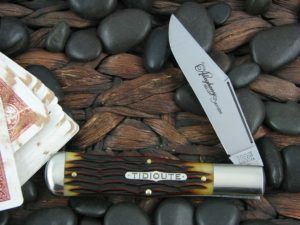 This is the Great Eastern Cutlery Tidioute Buffalo Jack Gunstock, has Goldenrod Bone handles and Nickel Silver liners. The blade steel is 1095 and finish is Satin. *Our opinion: The pull is a 7. The GEC effort on this run as compared to their entire catalog is 9. 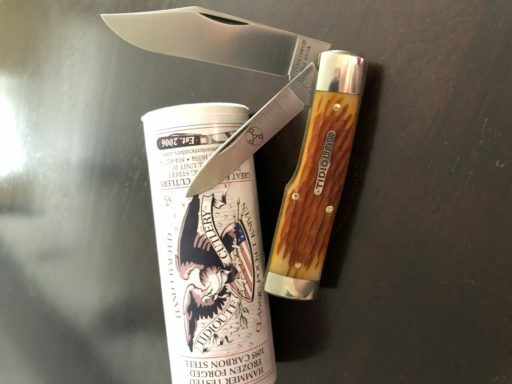 I am very pleased with my latest GEC pocket knife. The quality as usual is top-notch. I like that this one has straight lines. The end of the large bolster is pleasing to the eye. 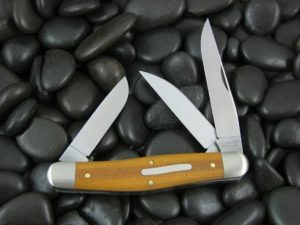 The Golden Rod jigged bone is also done with GEC’s fine attention to detail. 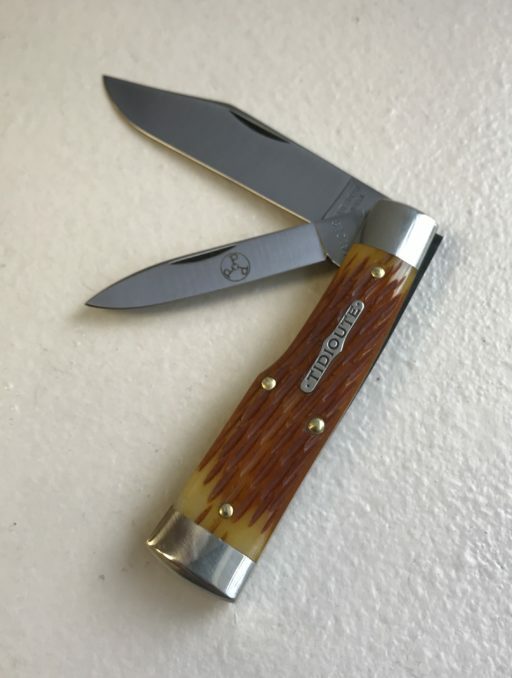 If you like traditional slip joints, this is a must have in your pocket! 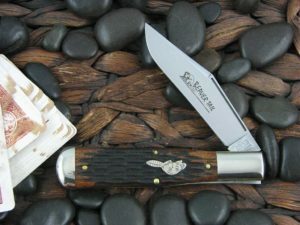 Another grandslam by GEC every thing about this knife is perfect. Great job. Everything about this knife is great. The fit and finish, the size, the walk and talk. And I love the goldenrod jigged bone on it. Over all great knife! 5 out of 5	Well made! I posted a picture already, but didn’t get to put a rating. This one is 5 stars. 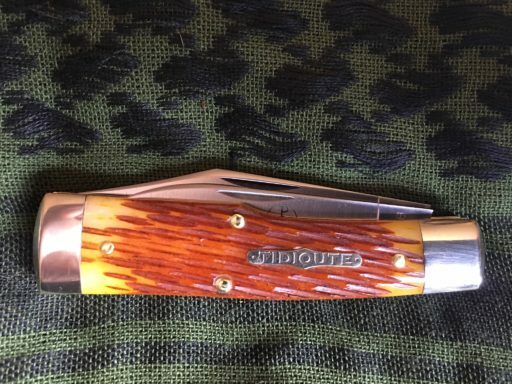 GEC #44 Gunstock in Goldenrod Jigged Bone. Looks: great! Fit & Finish: great! Action: great! GEC really outdid themselves on this one. I was initially reluctant to purchase a #44 because nothing about the overall lines of the knife appealed to me. But based on all the glowing reviews I decided to purchase and am glad I did. The #44 is a “get the job done” type of knife. 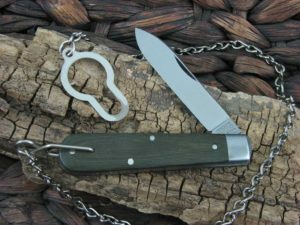 The size is perfect to slip into the pocket, and the additional weight of the knife coupled with great ergo’s make it perfect in the hand. For a knife I had reservations about it seems to get a lot of pocket time. Fit and finish and the service from CK always top notch. I bought the ebony #44 and then the Cocobolo/brass version. The goldenrod bone is very nice. I had to touch up the bone around one of the rivets as there was a small sharp point. A couple of strokes with a fine emery board took care of it. Other than that the fit and finish is perfect. As always Mike and CK are great to do business with.